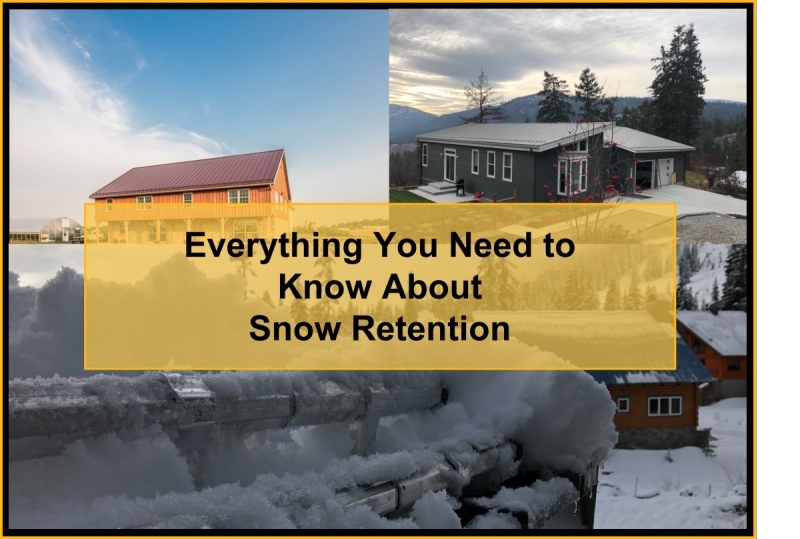 What is Snow Retention and Why is it So Important? In the metal roofing industry, snow retention devices or systems have a variety of names: snow stops, snow stopper, snow brake, snow guards, metal roof ice guard, snow clips, snow fence, snow rails, snow bar, and more. These devices have a central purpose - to hold or retain snow until it can safely evacuate the roof. When snow avalanches off a rooftop, it can damage whatever lies below. Although some may be in awe of this powerful expression of nature, rooftop avalanches can be deadly. Sudden release of snow can indeed be quite dramatic - dumping tons of snow all at once. But the process isn't voodoo! It is science! Falling snow forms a temperature-sensitive bond to the surface of the metal roof. As that roof is warmed from the sun or from building heat loss, the bond with the snow is broken and a thin film of melt water serves as a lubricant on the roof. Once this lubrication occurs, dramatic results ensue. These dramatic results can be a several-ton blanket of snow suddenly sliding off the roof and crushing anything in its path: gutters, vehicles, landscape, and even people. But don't be misled in thinking that now that the snow is off the roof, troubles are over. Once piled up below, that same snow bank can go on to cause additional troubles, like direct damage to the building walls, or even indirect damage caused by funneling melt water into, rather than away from, the foundations. Snow guards retain the snow and allow it to leave the roof slowly, either in small amounts or snow or as melt water...avoiding the dual calamity of the avalanche. Can I Reduce the Risk of a Roof Avalanche? 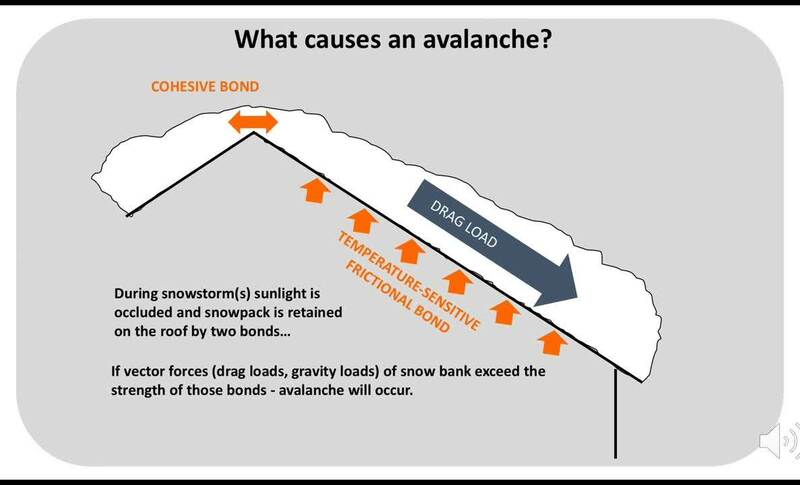 What is the Science Behind a Roof Top Avalanche? But merely placing snow fences over doorways or walkways will not save you from an unpredictable rooftop avalanche. It is very difficult to predict how snow banks will shear when only a portion of the bank is restrained. It will not, however, shear in a straight line from end of the snow retention system (also known as snow guard) up to the ridge. Rather, it will shear in a diagonal line toward the ridge. The angle of that line becomes more acute as the slope of the metal roof increases, resulting in a large, wedge-shaped bank of snow being supported by the system - not a small, rectangular shaped bank. This is because the snow bank has cohesive strength within itself. The cohesive strength varies with the density and temperature of the snow bank, which always changes. Hence, the angle of shear is impossible to determine with any certainty. LEARN MORE with our Tech Support FAQs. 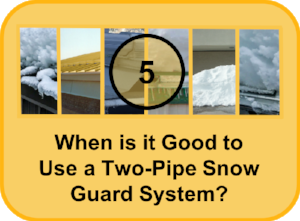 What Makes a Snow Guard System Durable and Reliable? Snow retention devices or systems keep snow in its place allowing it to leave the roof slowly, either in small amounts, evaporation or as melt water, avoiding the potential calamity of the avalanche. But a building owner needs to be able to rely on the metal roof ice guard at a moment's notice. And they also need to make sure attaching it doesn't create a whole new set of problems. 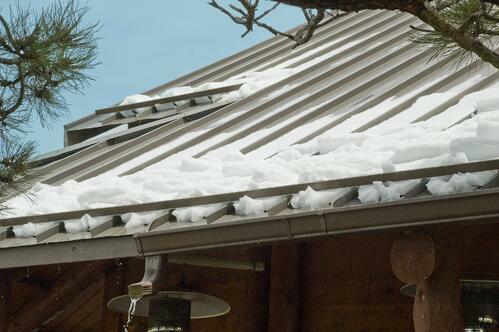 That is why durability and reliability must be the deciding the factors when determining the right way to mount snow retention to a metal roof. Although the field of snow retention is highly scientific and potentially life-threatening, the simple truth is, anyone and their dog can manufacture a snow guard system, market it with any fancy language they desire and sell it to the unsuspecting public. There are no “snow guard police” watching. No universal code or industry standard that governs this practice. No building inspectors that check snow guards for structural adequacy. This approach to a pretty serious business means that building/home owners are left out in the cold, (hopefully without a huge chunk of snow careening toward them); and it means architects and installers of such systems can potentially be held liable for both personal and property damage from faulty snow retention systems they specify or install. What is the Best Way to Mount Snow Retention? If you own property with a metal roof in snow country, you definitely understand the importance of snow retention. Whether residential or commercial, you have already made a smart decision by choosing a roof that has the longest service life possible. 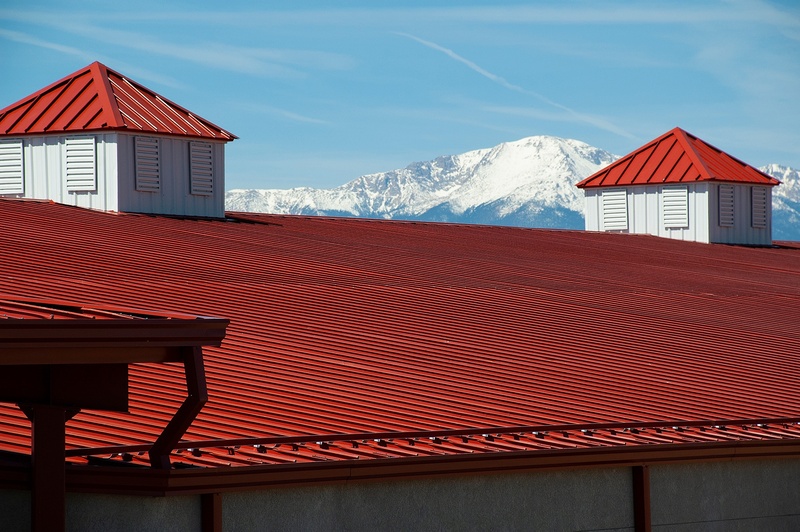 Metal roofing is indeed a “slippery slope” (pun intended), as you must consider the risk of roof top avalanches (personal danger and property damage), as well as the need for snow removal maintenance. A quality snow retention system will help you avoid these drawbacks, allowing the snow to melt safely away, providing decades of trouble-free service of your roof. But with metal roofs, you must consider the risk of roof top avalanches. A quality snow retention system will help preserve the integrity of your roof, avoid personal and property damage, and efficiently and safely allow snow to melt off your structure. But there are a number of methods to mount snow guard systems. LEARN MORE about the best way. How Do I Know What Snow Stops to Use on My Roof? 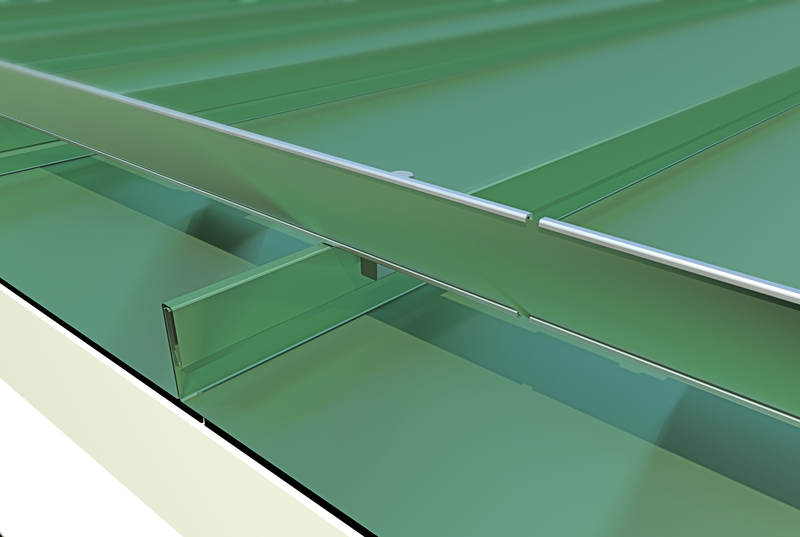 Learn More About the Differences Between Standing Seam and Exposed Fastener Roof Profiles. How Do You Attach a Snow Retention System to these Roofs? Let's start with the difference between standing seam and exposed fastener roofs. The profile of this roof, often abbreviated as SSR, has flat panels intersected with evenly spaced vertical legs or seams. Fastenings are concealed on these panels – hence the reason the profile is commonly called “concealed fastener”. SSRs can be attached to roof decks via clips or with a fastening flange. Fasteners are driven through clips into the roof deck but do not pierce the metal panels. 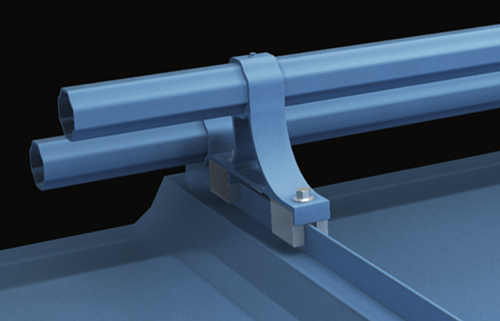 The clip and the fasteners are then hidden within the standing seam. 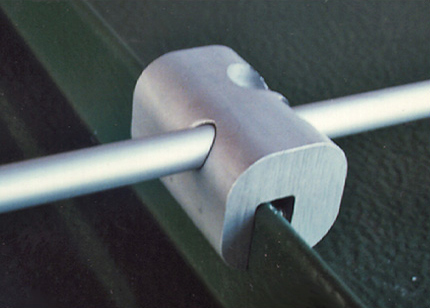 Thus, the panel is attached to the clips and locked together – either by snap-fit seam geometry or mechanically-folded during installation. SSRs come in a multitude of shapes and sizes, single-folded, double-folded, T-Shaped, Bulb-Shaped, and each are either snap-together or mechanically-seamed. 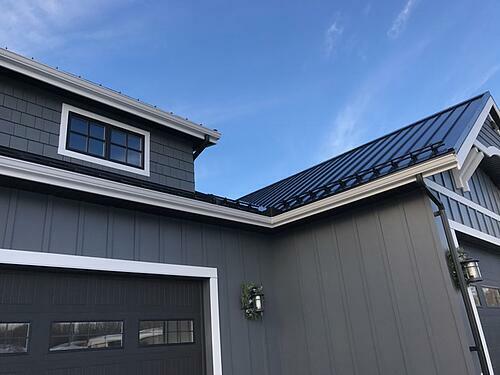 The industry consensus favors standing seam, for its higher quality, ability to respond to “thermal cycling” and aesthetic design. Metal panels need to be able to expand and contract. This is called thermal movement or thermal cycling. When a metal panel heats up from the sun, it expands – increasing in length. Then it contracts when it gets cold, reverting back to its original dimensions. This thermal movement is directly related to panel length. It will also accumulate and multiply across panel sections that are joined end-to-end with mechanical fasteners. You now have two or more panels - that think they are one – all adjusting to temperature changes. Exposed Fastener (commonly referred to as EF) roofs involve driving fasteners through the panels and directly into the roof deck. The edges of the panels overlap, and fasteners are screwed through both layers. The fasteners remain visible. Exposed fastener roofs are less expensive than standing seam systems. Lower cost comes from the fact that these roofs are manufactured with thinner gauge and wider-dimensioned panels, reducing material handling aspects of installation. This generally means that less roofing material is needed overall and thinner panels typically cost less. Additionally, EF roofs don’t use clips which also reduces costs (i.e. fewer components, and cheaper to install so overall total cost of roof is less). Exposed Fastener roofs do still offer substantial protection against harsh weather elements. But it is important to note that industry standards for standing seam versus exposed fastener are not necessarily equal. So, wind uplift testing may or may not have been performed on EF roof profiles. In addition, weather-tight warranties are not included with EF roofs. Holes are required to secure roof attachment to the deck - a process that is more prone to installation error. It’s not called an exposed fastener roof for nothing. What Snow Retention Fits My Roof Profile? 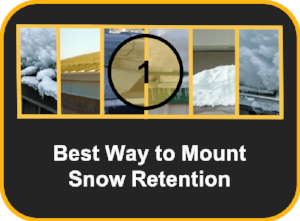 With that being said, there are three basic methods available for mounting snow retention systems to roofs. Two designs are mechanically-attached, using the process of either clamping to the seam (non-penetrating) or screwing through the roof material (penetrating); and the third method is chemically-attached and uses a “stick-on” method. This method involves gluing individual snow guards to a roof. 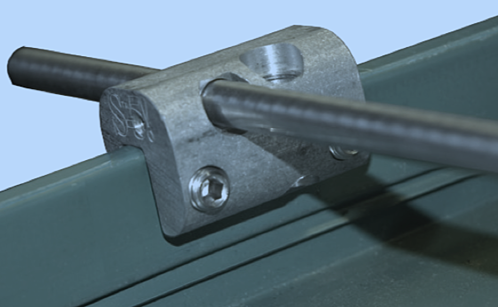 SMART SNOW STOP SYSTEMS FOR STANDING SEAM ROOFS - If you have a SSR, a clamp-to-seam snow stop is advised. Utilizing the clamp-to-seam method maintains roof warranties. 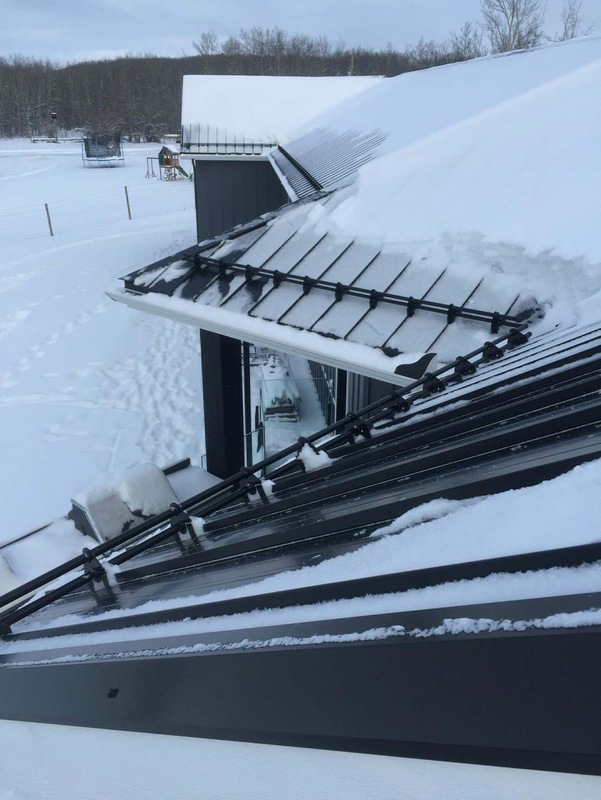 The vertical legs of a standing seam roof lends itself to zero-penetration snow retention systems. That is why S-5! clamps utilize mechanical-attachment with round-point setscrews. 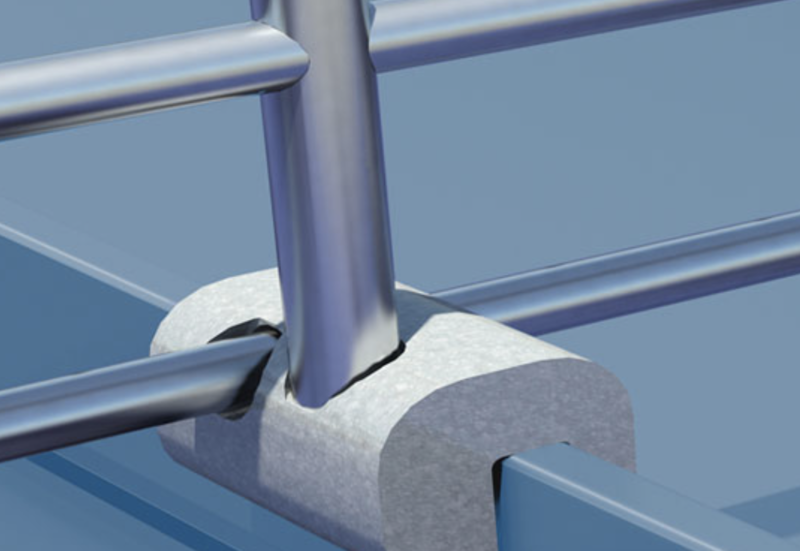 This allows the clamps to grip the standing seam securely without penetration and without causing any damage to the panel’s protective finishes. 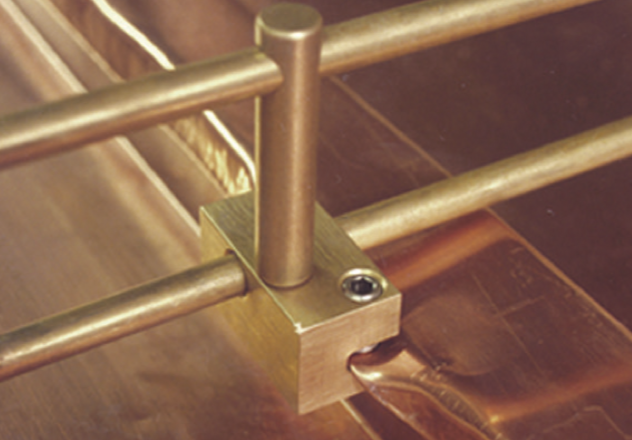 It is important that the clamps chosen for mounting are high-quality stainless steel, and not cast or plastic. S-5! products meet all of these qualifying conditions. SMART SNOW STOP SYSTEMS FOR EXPOSED FASTENER ROOFS - Brackets are a secure method of attachment for trapezoidal, exposed fastener, and corrugated roof profiles. Not having a seam to clamp onto means that a different attachment method must be used. 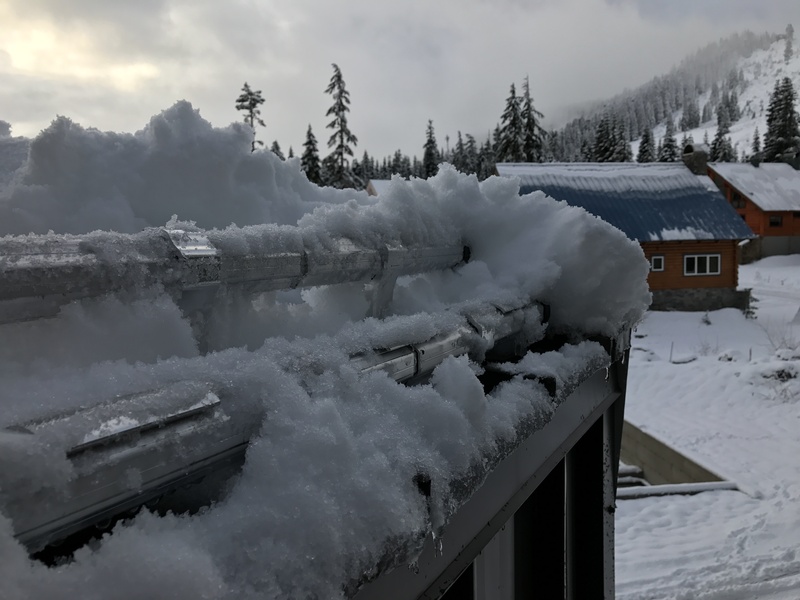 When mounting snow guard solutions to EF roofs, it is important to note the distinction between clamping and drilling a snow retention system onto a roof. Drilling requires holes. And holes in a metal roof need to be properly weather-proofed to prevent leakage. Brackets must be properly sealed to prevent UX exposure damage, drying and cracks. LEARN MORE about why a metal roof is not just a metal roof. 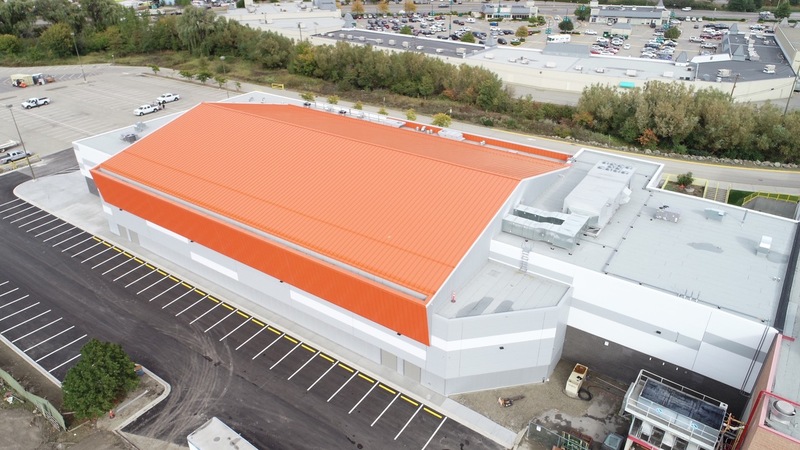 Standing seam and exposed fastener roofs may both be metal and may even serve similar purposes, but these two distinctly different concepts for metal roofing serve different purposes depending on location, weather, design, and more. Aesthetically-speaking and weather-wise, standing seam offers secure zero-panel-penetration as well as a long-lasting roofing solution. If cost is a big one for you, and you are also considering installing it yourself, exposed fastener may be a smart choice. Either way, S-5! has an attachment solution to serve your needs. There is a common perception that “more is better”, such as “two pipes are better than one” and “three are better than two”. Many believe that because a snow bank is very deep it should have a taller snow guard system—with more (or bigger) cross-members. Sometimes, designers or building owners simply want to make an architectural statement that the building is well protected by calling attention to the snow guard system, and for that reason choose a very robust system that is intentionally more visible. This, of course is a matter of taste and aesthetic. S-5! offers many different snow guard alternatives, including those which are only a few inches in height and visually blend into the roofscape. For those who believe that bigger is better, or just want the visual impact of a conspicuously robust snow guard system, we offer some that are two cross-members in height using unique pipe designs, and both 1 and 2 inch diameter pipes. (Note that adding a third or fourth pipe does not improve performance or structural capacity. In fact, it may reduce capacity due to the tipping moments introduced to the system with such heights.) Each of our systems is carefully designed and rigorously tested for structural capacity, and can be engineered to withstand any snow load with our online calculators. LEARN MORE about the right snow retention system for your needs with our snow calculator designed to help you plan out your snow guard project. The calculator saves you time and money in the planning process, including an option to get a low cost certified engineer's stamp on your calculations. There is a new (and much needed) document recently published by the Metal Construction Association (MCA): Qualifying Snow Retention Systems for Metal Roofing. This new industry consensus document is perhaps the most valuable tool in your toolbox if you are involved with any aspect of snow guard selection. But the light at the end of the tunnel comes in the form of the recently published Qualifying Snow Retention Systems by the MCA (Metal Construction Association). This technical guide bridges the gap between the free-for-all snow guard market and building owners, installers, and architects, who demand knowledge, strength, and a well-engineered system. But what exactly constitutes a well-engineered system? A snow guard system often has a beam-like cross-member, which “spans from clamp-to-clamp (or bracket to bracket) and is designed to restrain the snowpack and transfer the force of sliding snow into the clamp and/or bracket.” Structural components anchor the system and transfer “the vector load of the snowpack to the structure, roof covering, or another primary component” (e.g. mechanically fastened unitized snow-guards, seam clamps anchored to the roof seam, cross-members, or brackets that support cross-members). Let’s further define these structural components. LEARN MORE about how to select an engineer-based quality snow retention system. 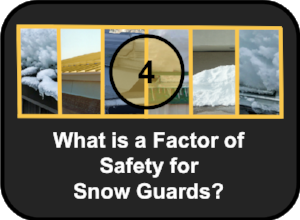 What is a Factor of Safety for Snow Guards? Recently, we had a contractor using our on-line snow retention calculator ask this question. He had done a number of planning calculations to customize applications of our ColorGard® system for a particular project, and noticed the field for “Safety Factor” on our load information table and also the calculator. What is this? And what does it do? Any anchorage of a snow retention system should be tested by the manufacturer to determine the load at which fastening failure occurs. The end game, of course, is to match that tested load to the requirements of a specific project or application to be sure failure is never reached when the system is loaded with snow. We test a minimum of 3 specimens to the point of failure and then enter the average of those tests on our load table. That load is the “ultimate” load—the point at which failure occurs. Of course, no one wants to see failure occur when a system is in service on a roof project, so a “Factor of Safety” (FS) is employed to determine a safe “working load”. This is the common and accepted practice of the engineering community. When applying a factor of safety to the ultimate tested load result, it reduces the load to an “allowable load”. Of course, without appropriate testing and quality assurances in production, it is all just guesswork. LEARN MORE about our Snow Guard Calculator and how it will perform the engineered calculations necessary to convert vertical snow loads into the sliding forces needed to match to tested allowable loads - taking into account the variables involved as well as the “Factor of Safety”. How Do I Use the Snow Guard Calculator? This is a two-part series featuring the S-5! Snow Guard Calculator. Step 1 covers why you should engineer your snow guard system and utilize our online calculator to get the job done. Below, we'll walk you through exactly the calculator's purpose. Then in Step 2, we'll explain exactly how to logon and get started! LEARN MORE about the why an engineered snow stop solution is critical to safety and to preserving metal roof integrity. Then start planning your project with our Snow Guard Calculator. How Do I know Which Snow Retention System to Choose? The most versatile bar-type snow retention system for all applications. ColorGard is mechanically attached with S-5! clamps. S-5! is the trusted name in metal rooftop attachment technology worldwide. S-5!’s , round-point setscrews grip the seam securely without penetration and without damage to the panel’s protective finishes. The clamps are precision-machined from aircraft quality, high tensile aluminum—not cast or plastic. All related hardware is non-ferrous stainless steel for lasting performance. X-Gard 1.0 is our one-pipe system spanning up to 48″ seams. X-Gard can be painted, powder coated, or anodized and is designed to preserve the coveted aesthetics of any metal roof. 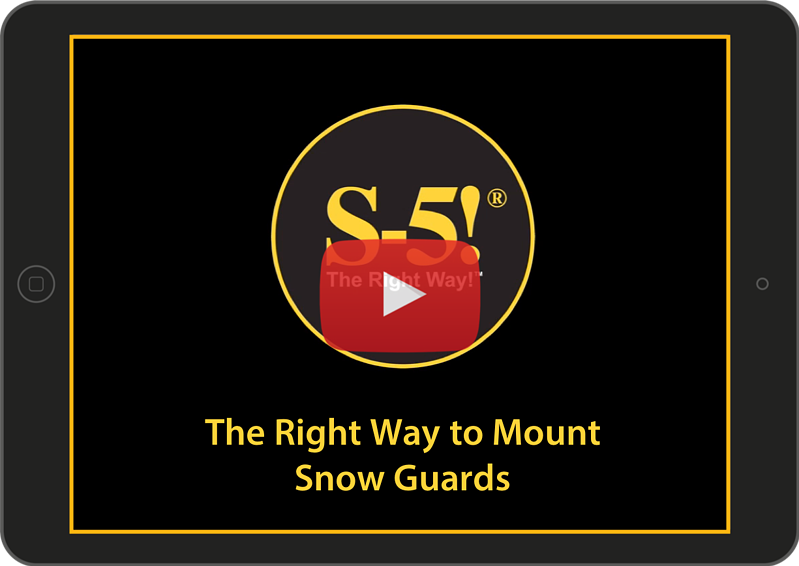 X-Gard is the newest snow retention (known as snow guards) innovation from S-5!. No other pipe snow retention system on the market has proven stronger than X-Gard. 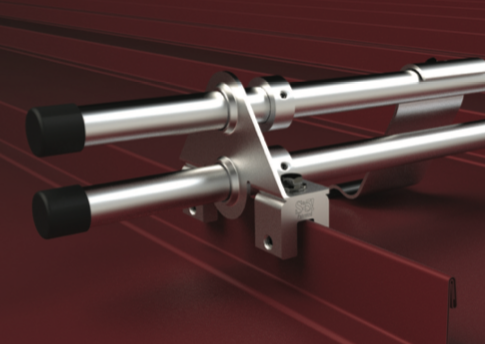 The innovative double-clamp design allows X-Gard to provide unprecedented holding strength when attached with S-5!’s standard or even mini-sized clamps. The employment of two clamps with each bracket and the unique shape of the NEX® 2.0 pipe enable a properly installed X-Gard system to provide a reliable snow retention solution in a wide variety of situations. This new metal roof ice guard can be easily retrofitted to existing roofs or incorporated into new construction design. It can be installed any time during the year on almost any metal roof profile. Finish Options: X-Gard is designed to preserve the coveted aesthetics of the metal roof. Based upon project needs, X-Gard can be painted, powder coated, or anodized as chosen by the customer. These finish option are available from limited S-5! distributors. Please contact distributors to discuss finish options and cost. 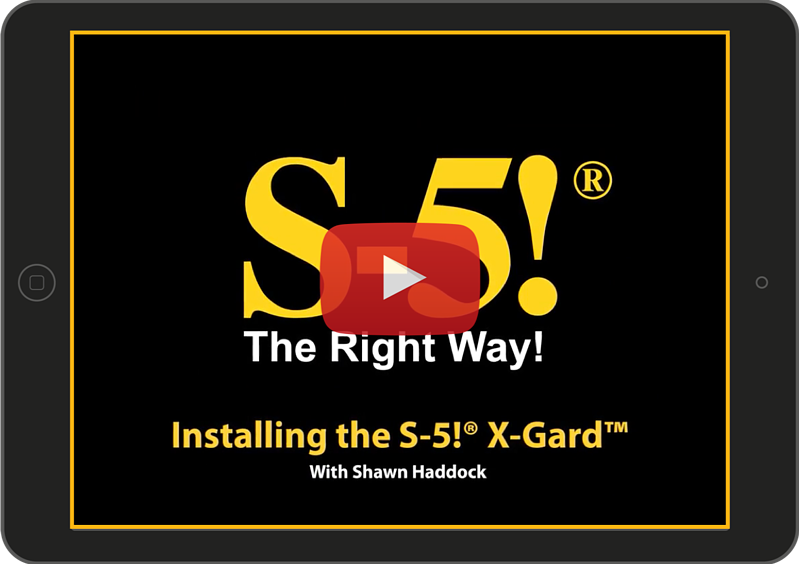 Versatility in Pipe Snow Retention: X-Gard can be purchased as a one- or two-pipe system, using standard S-5! clamps, depending on project specifics including pitch and snow load. 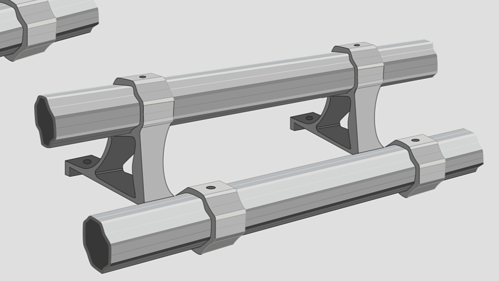 The single- and double-pipe options can also be paired with a locally-purchased round pipe (supplied by third-party), or, for superior holding strength, X-Gard can be paired with the NEX 2.0 pipe. Architects and roof designers agree: The clean lines, cylindrical shapes and high-tech look of our SnoRail systems present an attractive solution to snow retention problems! They function without cluttering the lines of the roof. 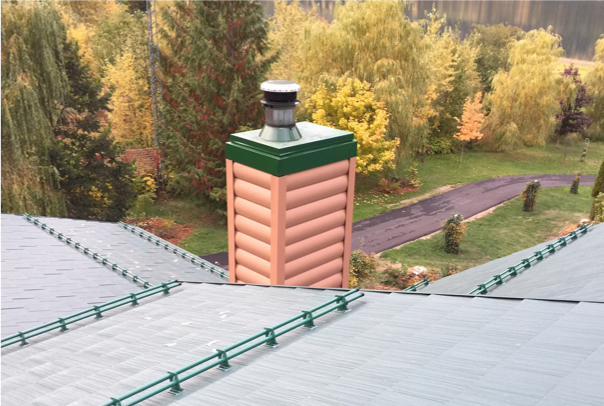 With up to six times the strength of adhesively-mounted devices, and without the high labor costs and inconsistencies of soldered snow guards, S-5!® offers the perfect, long term, dependable solution for traditional standing seam and sheet copper roofing. 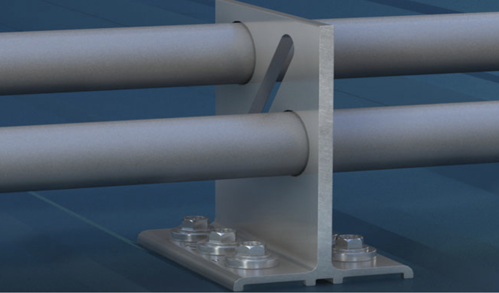 SnoRail systems are mechanically attached with S-5-ASF and S-5-BSF aluminum or brass clamps utilizing our round-point setscrews—designed not to “pin” or “fix” the roof panels to the building, leaving thermal movement unrestricted. The clamps are precision-machined from aircraft quality materials, not cast or plastic. All related hardware is non-ferrous, compatible stainless steel or brass for lasting performance. SnoFence can be designed and engineered on a site-specific basis. Architects and roof designers agree: The clean lines, cylindrical shapes and high-tech look of our SnoFence systems present an attractive solution to snow retention problems! They function without cluttering the lines of the roof. SnoFence systems are mechanically attached with S-5-ASF and S-5-BSF aluminum or brass clamps utilizing our round-point setscrews—designed not to “pin” or “fix” the roof panels to the building, leaving thermal movement unrestricted. The clamps are precision-machined from aircraft quality materials, not cast or plastic. All related hardware is non-ferrous, compatible stainless steel or brass for lasting performance. DualGard™ is the most versatile and reliable 1-inch, two-pipe snow retention system on the market for all standing seam roof applications. 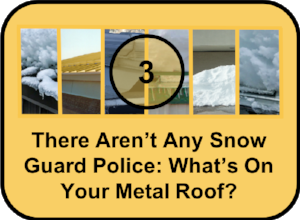 DualGard is a metal roof ice guard that utilizes two patented S-5! mini clamps for extra strength versus other two-pipe systems. All DualGard components can be used with VersaGard™ and VersaGard™ V, offering a complete snow retention system for exposed fasten roofs. Versatility, reliability and strength in one system. DualGard™ is a complete, two-pipe snow retention system created for those who prefer a pipe-style snow retention system with the strength, testing, quality and time-proven integrity you expect from S-5!. DualGard can also be color-finished to match the roof. The system utilizes two anchor points per bracket, and can be engineered for structural adequacy online with our new DualGard calculator and backed by independent lab testing. DualGard is the most versatile and reliable pipe system on the market. And, in the S-5! tradition, also the lowest cost. When snow accumulations begin to melt, the result can be catastrophic as a heavy blanket of snow avalanches from the roof. DualGard gives you a reliable solution. Incorporating independently A2LA-certified laboratory-tested S-5! Mini clamps and the online calculator, you can be assured that DualGard will hold up to the challenge. As with S-5! ColorGard®, SnoRail™/ SnoFence™ and X-Gard™, the DualGard snow retention system provides superior, documented holding strength when compared to individual cleats, adhered plastic parts and other snow retention systems. 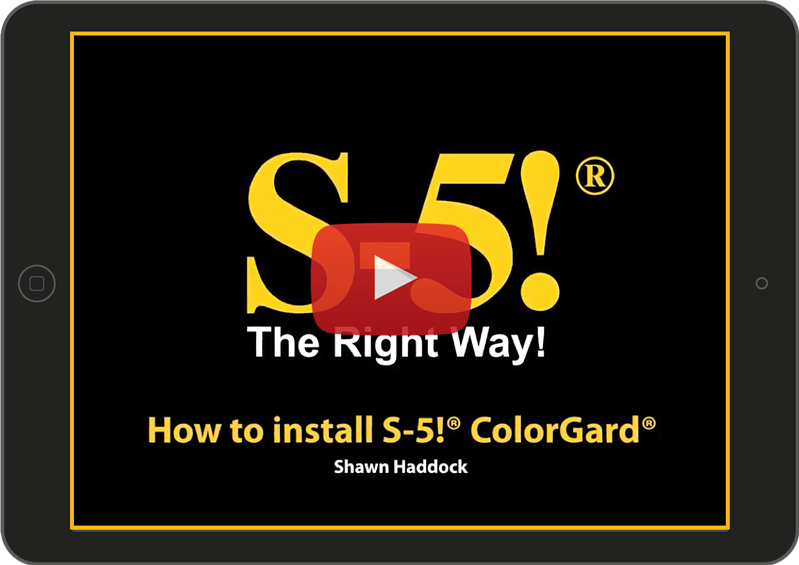 When other brands claim to be “just as good as S-5!”, tell them to PROVE IT. When designed and installed correctly, snow retention systems are used to protect property and individuals. That’s why all S-5! clamps and snow retention systems are thoroughly tested and certified by an independent third party lab. 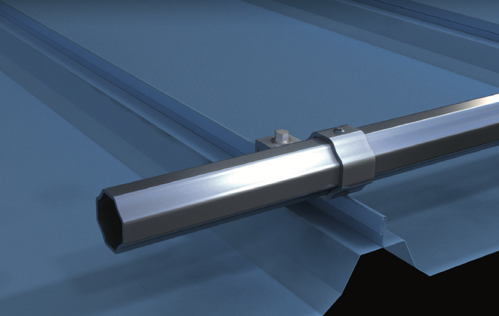 VersaGard™ is compatible with almost any trapezoidal, exposed‑fastened profile. No messy sealants to apply! No chance for leaks! VersaGard comes with factory‑applied butyl sealant already in the base, and the S‑5!®‑ reservoir conceals the sealant from UV exposure, preventing drying and cracks. Installation is simple! VersaGard is mounted in the flat of the panel, directly into the supporting structure of the roof, i.e. wood decking, wood or steel purlins, or trusses. No surface preparation is necessary; simply wipe away excess oil and debris, peel the release paper from the base, align, and apply. Secure through the pre‑punched holes using the appropriate screws for the supporting structure. While the circular holes in the vertical part of the bracket support 1″ pipes, the diagonal slot provides flexible support for PV installations via the use of 3/8″, M8 or M10 bolts. VersaGard can dramatically reduce the risks associated with snow avalanches sliding off of roofs, dumping tons of snow onto anything in its path, at an amazingly affordable price. 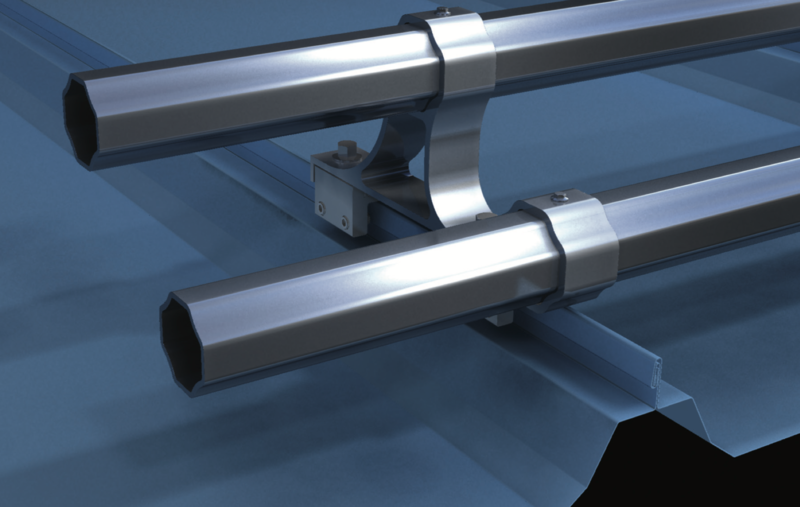 A VersaGard pipe snow retention system functions without cluttering the lines of the roof and is dramatically stronger than adhesively‑mounted snow guards. S-5! invented metal roof attachment solutions. We know "The Right Way" to attach virtually anything to a metal roof. We're industry leaders. We constantly strive to be the only choice for metal roofing attachment solutions in the world. We're also industry activists. We lead the way by pioneering studies that promote industry growth through innovative new products, performing rigorous testing on all products, and ensuring service excellence. We see your attachment solution and raise you The Right Way to attach virtually anything to a metal roof. Contact a snow retention specialist below.